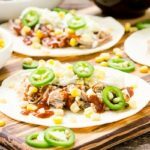 Barbecue Pulled Pork Tacos are a southern twist to a Mexican dish. Taco shells are filled with pork, cole slaw, corn, and jalapeños for a delicious meal. Place 2 ounces pulled pork on each taco shell. Drizzle barbecue sauce on pork. Place 2 tablespoons coleslaw on top of pork. Sprinkle corn kernels and scatter jalapeño slices on top. Amounts of ingredients are approximate. Use your judgement on how much of each for each taco. Increase or decrease as desired.